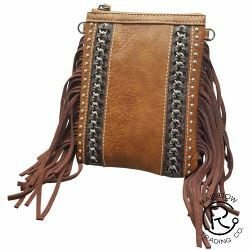 Genuine leather crossbody bag with brown leather top closure and cowhide bottom. 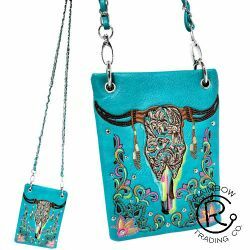 Turquoise PU leather messenger bag with embroidered ornate steer head. 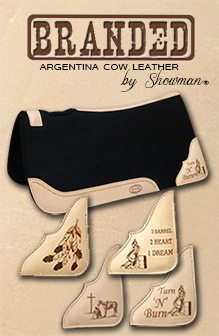 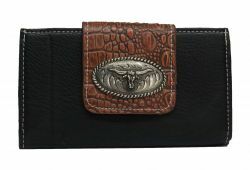 Dark Brown PU leather billfold wallet accented with brown alligator print and cut out steer head with cowhide inlay. 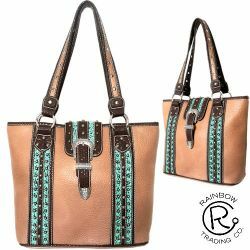 Brown PU Leather handbag with large buckle flap closure and teal filligree bottom. 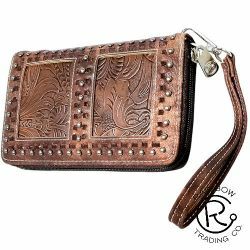 Brown PU leather folding wallet accented with buckle closure. 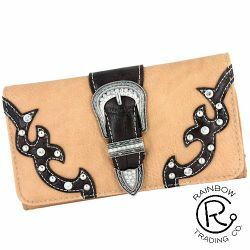 Cream PU leather folding wallet accented with buckle closure. 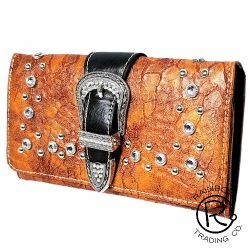 Metallic Brown PU leather folding wallet accented with buckle closure and distressed leather. 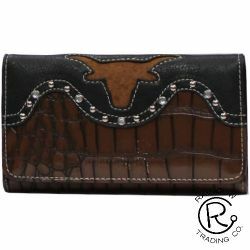 Black PU leather folding wallet accented with buckle closure. 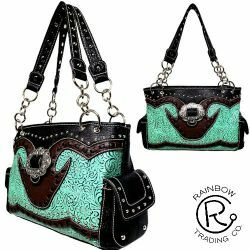 Black PU Leather handbag with teal filligree inlay. 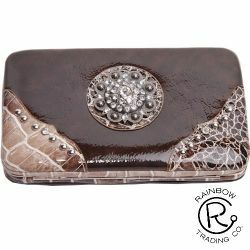 Beige PU leather folding wallet accented with buckle closure. 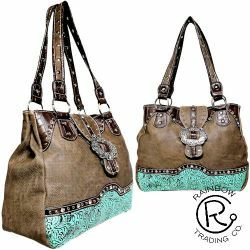 Beige PU leather handbag with teal filligree overlay. 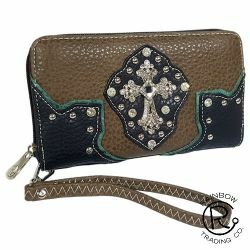 Brown PU leather zipper wallet with crystal rhinestone cross in center. 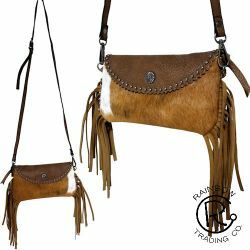 Light brown PU leather messenger bag with leather and metal chain lacing. 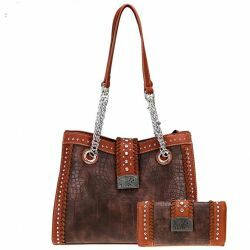 Montana West ® Brown Alligator Print handbag and tri-fold wallet set with leather lacing and buckle closure. 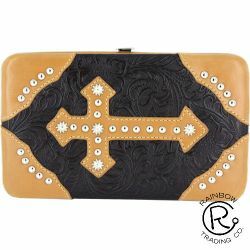 Black PU leather clasp wallet. 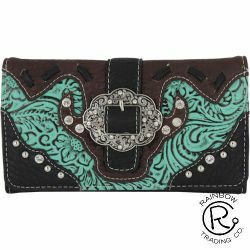 Black PU leather clasp wallet with turquoise stone. 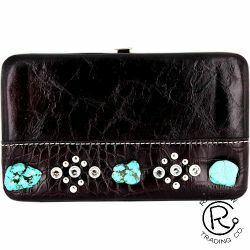 Black PU leather clasp wallet with turquoise stones. 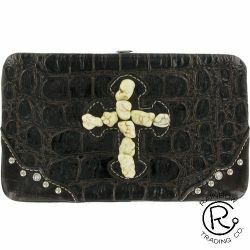 Black Alligator PU leather clasp wallet with stone cross. 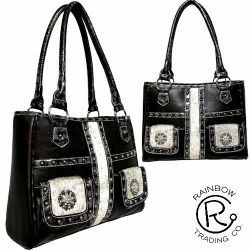 Black PU leather handbag with cowhide overlay. 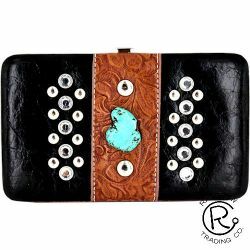 Black PU leather wallet with long horn steer concho. 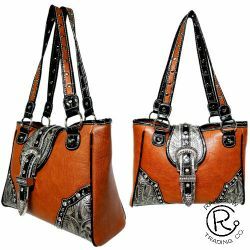 Camel PU leather handbag with large buckle flap closure. 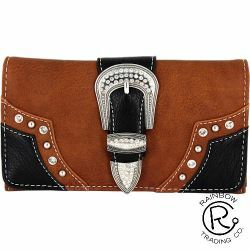 Brown PU leather clasp wallet with large crystal rhinestone concho in center. 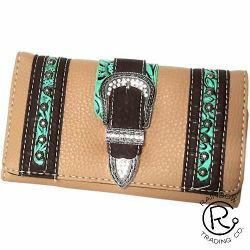 Brown PU leather zipper wallet with embossed leather inlays. 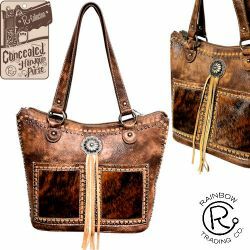 Brown distressed PU leather conceal carry handbag with cowhide accents. 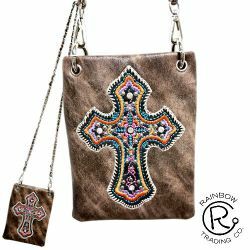 Brown PU leather messenger bag with embroisered cross and crystal rhinestone studs.